A tall attractive woman carried an ethnic tote over her shoulder, hoisting it into the overhang compartment on our flight to San Francisco. Unlike my carry-on luggage, it slid right in. Ivory cotton with leather strapping, her bag had caught my eye while we were waiting to board. She looked like she had been around the globe once or twice. I came close to asking her where she had found the tote. But certain she’d sweep her long blond trusses back and mention a market in Morocco, I didn’t ask. We had come to San Francisco to furnish an apartment in a Victorian building (c. 1896) on Buena Vista Park. Across the park is Haight Ashbury. So it seemed appropriate that, like many before us, we started off on an air mattrass in an otherwise empty flat. Take a stroll with me down The Haight today, if you will. I make it sound like the Champs-Elysee, but really it’s more like a street scene out of Blade Runner. A psyche ward turned out. People without meds inhabiting the same corner day after day. Dark coats, seedy scarves, hats, and fingerless gloves. Unwashed, uncut, ratted hair—it’s not like the musical “Hair” anymore. There’s no music now. Double decker tour buses roll through The Haight daily. Visitors gape, and I wonder what they see. Do they are seeing it as it is now, or as it was then? For my part I like to walk it and imagine it in its glory, back in the day when we all knew someone who ran off to San Francisco. Young girls tumbling in and out of thrift shops, flinging feather boas around their necks like Janis Joplin. The thrill in the shrill of their voices. Guitars tuning through open windows. Skinny-legged tambourine men playing on the street. I see all this. What were once young idealistic kids in bell bottoms, and what were once colorfully painted store fronts and buildings. Gone dark with dirt and grime, and everyone aged. I’ve been thinking about nothing but juxtaposition lately. Into the Victorian beauty with eleven foot ceilings and 12” molding, we had every intention to go modern and minimalist. I knew where I would begin: HD Buttercup. I Uber’d over so I could Uber X back in a SUV with my bounty. Three small tables, as it turned out. A side table in brass and glass, and a pair of night stands in brass with a marble top. Other contemporary pieces came in: a pair of Barcelona chairs, an over-scaled orb chandelier—the fixture Joanna Gaines draws into nearly every interior on Fixer Upper. Drunk as I was on modern design, I thought I’d be back. But that was before I ran into Big Daddy Antiques. Every apartment should turn over now and then. 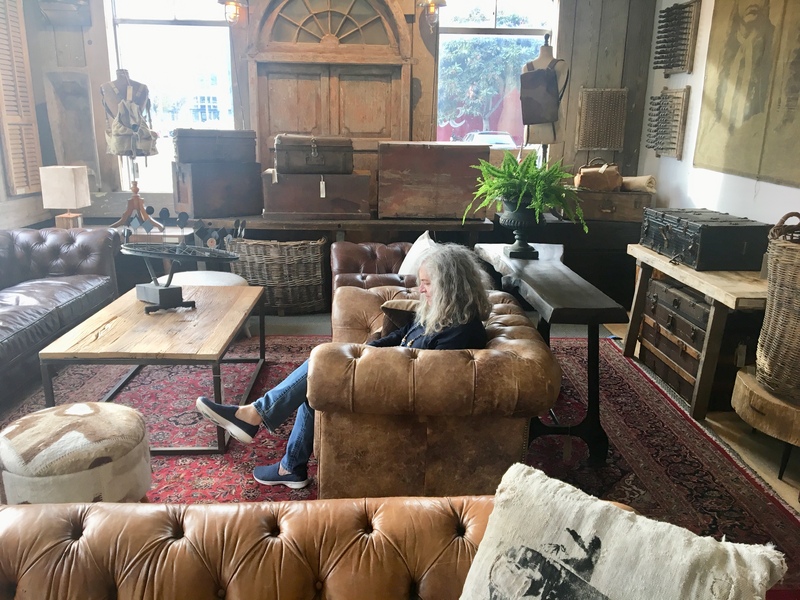 From Big Daddy we came home adding texture with a long Mongolian mohair pillow in white for a gray sofa, a Mongolian mohair ottoman in black for the Barcelona chairs, a cement table, and a low table topped with camel bone. But really, you could have just left me there, in that warehouse on 17th Street in SF. Apparently I can’t do one without the other; modern alone can be cold. As for that oversized tote that had caught my eye en route to San Francisco, I found that too for sale at HD Buttercup. What are the chances of that? What are the chances of anything? Now I’m throwing that tote over my shoulder, looking like I know what I’m doing. But we never really know. Like my decidedly modern design direction that took an artisanal and indigenous turn.